Starting with that first impression, it’s clear that they want you to feel at home. I was almost surprised that a Labrador retriever didn’t greet me at the door with a pair of slippers. Much like a pair of Ralph Lauren khakis, both the atmosphere and the attitude of the service embody this feeling of relaxed casual, but still exude a certain air of sophistication. I have been sitting on this review for a couple of days now, and when I think back on my meal, the word that keeps coming to mind is “clean.” The food was a perfectly-tailored, crisp, button-down, white shirt. The presentation of each dish was impeccable, but not overly complicated, and every flavor on the plate, no matter how small, was distinct. It’s clear that when Chef Perello picks out an ingredient for her market-driven menu, she doesn’t want it to serve as filler, but rather, make sure that its presence is felt. Well, tasted. What I found especially impressive was that, even though she wants to shine a spotlight on individual ingredients, she ensures that both the cut and the quantity found in the dish are controlled; a little thing called restraint. A perfect example of said restraint is the Chestnut Soup ($8), where bits of salty Boccalone pancetta and sweet cipollini onion pop up every now and again to say hello, but aren’t found in every bite, allowing the pure taste of chestnut to shine. My favorite dish of the night was the Grilled Calamari ($6.50), with Rugosa squash, preserved lemon, and currants. First of all, where did Rugosa squash come from, why hadn’t I tried it before this dinner, and why can’t I eat it every night? It’s absolutely delicious – officially my favorite squash varietal. 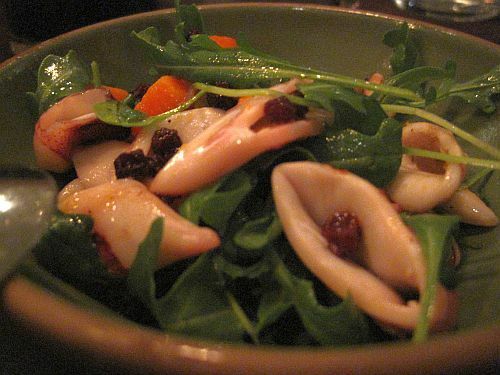 Secondly, I was happy to see grilled calamari served without cannellini beans and capers, and Perello’s unique combination of ingredients was particularly thoughtful. The squash mirrored the texture of said beans but provided an extra layer of sweetness, while the preserved lemon almost functioned as a caper substitute, adding both acidity to the calamari and tartness to balance the squash. At the same time, this play on sweet and sour was also found in the tiny currants, making it so that with every bite layers of sweet-sour-salty flavor unfolded in your mouth. Other dishes to note were the Semolina Gnocchi ($12), perfectly light and fluffy, served with duck confit and braised cavolo nero, and another favorite, the Lacinato Kale and Crepe Cannelloni ($17) stuffed with meaty mushrooms, melted leeks, and La Tur cheese. While the fresh, unmistakable flavors of the mushrooms and leeks were delicious, it was really slightly tangy, earthy, creamy qualities of this cheese that left the lasting impression. Finally, the Grilled Bavette Steak ($23), served with caramelized onions and a green garlic ‘chimichurri’ was another excellent example of restraint and spot-on execution. And the dessert. Oh my goodness the dessert. Do you know what heaven tastes like? Because I do. It tastes like a Valhrhona Ganache Tart with McEvoy Olive Oil Ice Cream from Humphry Slocombe. They also offer a house wine, which they don’t sell by the bottle, but by the ounce. $1 per ounce, and you only pay what you drink. How’s that for making you feel at home? Finally, while all of the servers have been working in the industry for over 10 years, and have names like Gordon Ramsay and Coi under their belts, their attitude is in no way pretentious or stuffy. As our server explained, the experience is there so that when the diner asks a question about the menu or the wine, the staff has the knowledge to give a thorough answer, not so that they can impress the customers with their resumes and maintain an air of formality. A lively, comfortable, classy neighborhood restaurant serving fresh, local ingredients and gaining popularity by the minute. My advice? Make your reservation soon, before you have to start booking weeks in advance. Then, just kick back and relax.